The Loudoun County Board of Supervisors has approved a developer's ambitious project to develop a 158-acre mixed-use community between the Silver Line's Ashburn and Loudoun Gateway Metro stops, with plans that include thousands of townhomes, condos and apartments. Detroit-based Soave Enterprises, which developed Loudoun’s 2,800-acre Brambleton community, envisions The Silver District West development to include more than 380 townhomes, more than 3,300 apartments and condominiums over the next 20 years, space for an elementary school, a 23-acre public park, and office and commercial use. Loudoun County held more than a dozen public hearings before the board of dupervisor’s approval at its Thursday meeting. The developer will provide 8 acres for a future elementary school, and will build a large portion of the Shellhorn Road Extension to Route 28 at Sterling Boulevard, considered an alternative commuter route to the Dulles Greenway. It will also be responsible for the majority of infrastructure expenses as part of the development, a proffered infrastructure package the county values at more than $84.5 million. 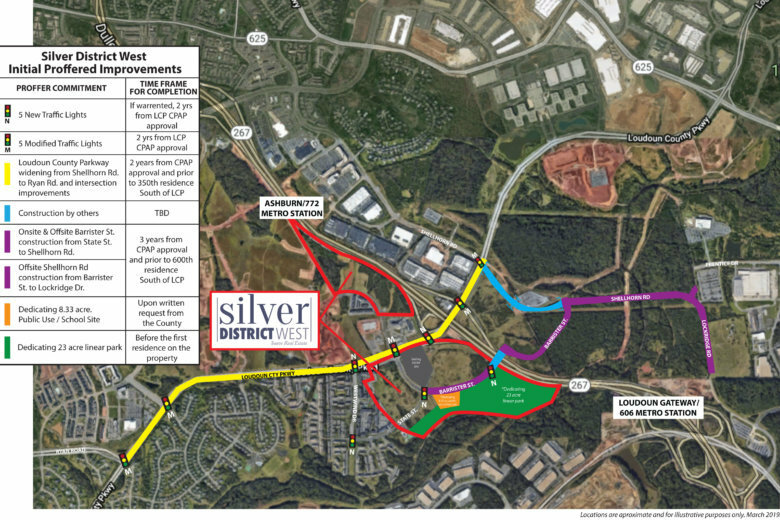 Silver District West will be the third large-scale, transit-oriented development along Loudoun County’s share of the Silver Line, following Loudoun Station and Moorefield Station.